Sample shown with Violet ink and optional Violet Glossy lining. Exclusive to The Stationery Studio! 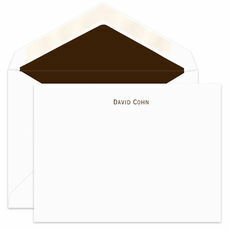 Set of 50 plain white flat note cards, sized 5.25" x 4". Printed in raised ink color of your choice. Flat printed return address available. Typestyle and positioning only as shown.